Vanity, which is also known as pride in the list of deadly sins, is considered to be the original sin, the source for the others. It is described as an excessive love of self and a desire to be more important or attractive than others. This leads the sinner to ignore the good work of others, only focusing on themselves. Christians believed that Lucifer's original sin was pride, leading him to compete with God and therefore falling from heaven to transform into Satan. The popular understanding is that if a person succumbs to pride or vanity, their fate will be the same as Lucifer's. The Disney film which has the most obvious display of vanity is Beauty & The Beast. In this film, Gaston is a character who is completely self-involved. Although he chooses the lovely Belle to wed, his true love is himself. He completely disregards the positive qualities of other people, especially females. In Gaston's opinion, women are objects, and he must own the most beautiful one. In a love story between Belle and Beast, Gaston intrudes and attempts to steal Belle away, and when he is rejected, his vanity leads him to attempted murder of his opposition. Many original Disney villains are also self-involved, however Gaston takes the metaphorical cake as the most narcissistic Disney character, in my opinion. There are certainly other characters in Disney films that exhibit signs of vanity or pride, although none of them are so overwhelmed with their own existence as Gaston. 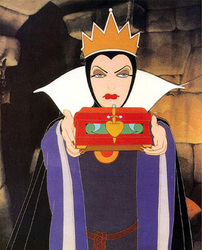 The Evil Queen in Snow White & The Seven Dwarfs is consumed with the desire to be the "fairest in the land", which makes her extremely vain. She neglects to see the positive aspects of Snow White's personality and instead, she sees someone that is more beautiful than herself. Disney may characterize her as being vain, however she also could be considered wrathful and envious towards Snow White. A character in a Disney film which is able to snap out of his prideful nature is Rabbit in Winnie the Pooh. 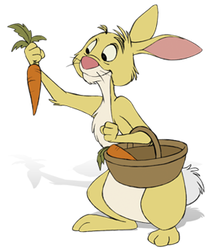 This talking rabbit is both a narcissist and a control freak, only caring about himself and maintaining his garden. He, like other narcissists, does not show compassion for other people, choosing hurtful measures of punishment when his friends ruin his garden. Unlike Gaston however, Rabbit does have sincere friends, and sometimes snaps out of his self-absorbed world to assist friends in need. Rabbit, for not being completely consumed with vanity like Gaston, is not harshly punished for his sins in the film.